Delicious and easy Cheese Stuffed Manicotti Bake using fresh parsley, and a mixture of Ricotta, Parmesan, and Mozzarella cheeses. In a medium sized mixing bowl combine the Ricotta, 3/4 cup Parmesan, Mozarella, eggs, fresh parsley, salt and pepper. Mix well. Take the uncooked Manicotti shells and stuff with the cheese mixture. 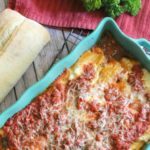 Line the cheese stuffed manicotti in a 9 x 13 baking dish. Cover with Mezzetta Tomato and Sweet basil sauce, then sprinkle the top with remaining 1/4 cup paremesan cheese. Bake in the oven for 45 minutes. Allow to cool for 5 minutes before serving.